If you assume from the outset that young-earth creationism is true, then no, this isn’t illogical. On the other hand, if you’re talking to someone with different assumptions, then this question is meaningless. 4. Doesn’t the second law of thermodynamics disprove evolution? People who ask this seem to think that the law states that disorder in the universe is always increasing, everywhere. While it’s true that the SLT states that “the universe as a whole gets more disordered and random as time goes on” (see link below), this doesn’t logically conflict with evolution. Here’s how David Rothstein (a former postdoctoral researcher at Cornell) answered this question: http://curious.astro.cornell.edu/question.php?number=441. I don’t agree with Rothstein that evolution is a fact: my point is that evolutionists do, in fact, already have coherent reasons why the SLT doesn’t contradict their theory — and stating that it does will only make us sound silly. Evolutionists assume that physical, observable causes are enough to explain everything (see below). In this case, the physical cause would be the rotation of the earth. Maybe you mean, “How do you explain the fact that humans often find sunsets beautiful and awe-inspiring if we’re all just meat machines that have mindlessly evolved to only develop traits that contribute to survival?” An evolutionist would say that, at some point, appreciation of beauty in nature developed by accident in an individual and somehow made them more likely to survive and pass on their genes (or at least didn’t impede their survival). There are further questions that could be asked from there, but my point is, evolution proponents aren’t going to be caught off-guard by questions like this, as though they’d never considered them before. They certainly aren’t going to be stumped by asking how they explain this or that natural phenomenon: the answer will always be either “Here’s our explanation” or “We don’t know yet, but we’ll find out.” This also applies to #13 in the above article. 9. If God didn’t create everything, how did the first single-celled organism originate? By chance? That’s what they’d say, yes. Evolutionists have been developing answers to the origin of life for a long time, and simply pointing out that origin by chance seems improbable is not going to make their whole system collapse. 14. If evolution is a theory, then why is it taught as fact? In science-speak, a “theory” is a system of ideas that’s been repeatedly confirmed over time by observation and experiment. It’s not just a guess or a bright idea. That means that evolutionists believe that their “theory” is well-supported by a large body of evidence. This one has been kicked around for decades by creation proponents who don’t understand how evolution is supposed to work. 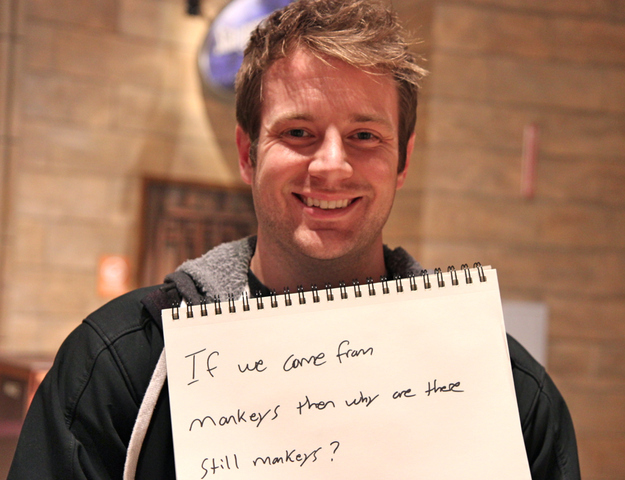 The theory doesn’t state that every last primate evolved into humans. The theory is that a certain group of primates underwent certain genetic changes that gradually transformed them into Homo sapiens, and the rest of the monkeys just went on being monkeys. Now, I absolutely don’t think that this actually happened at all, but we need to at least understand what we’re arguing against! Asking questions when you don’t understand what you’re questioning doesn’t make you look smart: it makes you look foolish. The fact is, there is no “magic bullet” — no single question or piece of evidence that will bring evolution to its knees. Furthermore, argument alone will never be enough in most (if any) cases. Creationists, think about it: could you ever possibly be convinced by argument alone that evolution is true? Probably not — because you assume from the beginning that it’s based on false premises. It’s the same for evolutionists: they assume the basis of our argument to be false. This is where we find the real intellectual gap between the two sides: in basic assumptions. One believes that only the natural world exists; the other believes in the supernatural. * One believes that the Bible is the word of God; the other sees it as words of men. Because we start with different assumptions, we can both look at the same physical fact (like geological layers, for instance) and both see it as evidence for our own belief. Finally, on a whole different level, people of our generation won’t be turned by argument alone. There has to be a conversation (not a monologue) within the context of a relationship. You can expostulate all you want, but if your listeners don’t know and trust you, they won’t be listening for long. These questions (and others) might at least give grounds for discussion. I don’t intend for them to be used as sledgehammers to pound the other side into submission (they won’t work that way), but rather as lenses by which to take a long, hard look together at the foundations of what we believe and why. These questions will lead to more questions (a fair number of them aimed back at you), so if you’re not prepared to go there, don’t ask them. What reason do we have to assume that only matter and energy exist? Can you believe that the first cell originated by chance without knowing how it happened? Why? How did we come to assume that science is the only way to discover truth? And remember, as you’re discussing these and other questions with a friend, they won’t throw in the towel simply because they don’t immediately know all the answers. You wouldn’t either. *I realize that, by representing the whole debate as two-sided, I’m leaving out a lot of “middle positions” that fall within the realm of “theistic evolution.” That’s a whole other can of worms, and I see a lot of problems with it. I think Al Mohler’s recap of last night’s debate is a good resource on this controversy, accurately pointing out that the real issue between Nye and Ham (and between evolutionists and creationists) is one of definitions and assumptions. Some have noted that neither Ken Ham nor Bill Nye are scientists. But they are a good pairing; both are scientifically-minded laypeople who have spent the better part of their careers arguing for the account of origins that they believe is true. The fact that both men for years have aimed to make the origins issue understandable to a broad audience made this a unique opportunity for laymen to gain an understanding of the differences between these radically different worldviews.